From one of our most heralded writers--Joy Williams belongs, James Salter has written, "in the company of Céline, Flannery O'Connor, and Margaret Atwood"--her first novel in more than a decade: the life-and-death adventures of three misfit teenagers in the American desert. Alice, Corvus, and Annabel, each a motherless child, are an unlikely circle of friends. One filled with convictions, another with loss, the third with a worldly pragmatism, they traverse an air-conditioned landscape eccentric with signs and portents--from the preservation of the living dead in a nursing home to the presentation of the dead as living in a wildlife museum--accompanied by restless, confounded adults. A father lusts after his handsome gardener even as he's haunted (literally) by his dead wife; a heartbroken dog runs afoul of an angry neighbor; a young stroke victim drifts westward, his luck running from worse to awful; a sickly musician for whom Alice develops an attraction is drawn instead toward darker imaginings and solutions; and an aging big-game hunter finds spiritual renewal through his infatuation with an eight-year-old--the formidable Emily Bliss Pickless. With nature thoroughly routed and the ambiguities of existence on full display, life and death continue in directions both invisible and apparent. 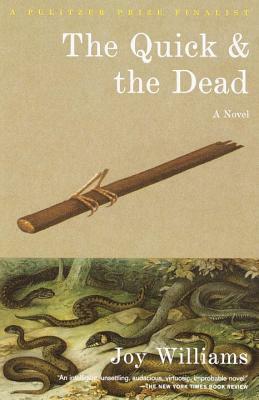 Gloriously funny and wonderfully serious, The Quick and the Dead limns the vagaries of love, the thirst for meaning, and the peculiar paths by which all creatures are led to their destiny. A panorama of contemporary life and an endlessly surprising tour de force: penetrating and magical, ominous and comic, this is the most astonishing book yet in Joy Williams's illustrious career. JOY WILLIAMS is the author of four novels—the most recent, The Quick and the Dead, was a runner-up for the Pulitzer Prize in 2001—and four collections of stories, as well as Ill Nature, a book of essays that was a finalist for the National Book Critics Circle Award. Among her many honors are the Rea Award for the Short Story and the Strauss Living Award from the American Academy of Arts and Letters. She was elected to the Academy in 2008. She lives in Tucson, Arizona, and Laramie, Wyoming.